Displaying 1 - 50 of 122 items. The latest and greatest hits arranged by some of the top arrangers in the field. The Alfred Pop Series features outstanding arrangements of songs from the popular music genre. America has a great tradition of early folksongs many which are presented in this fine collection. There's nothing like a Broadway show tune and this series features some of the best with arrangements suitable for beginning choirs thru to the most advanced ensembles. A series of scared songs suitable for choirs of all abilities. Big hits, big songs, big fun! This series offers songs from many of today's top artists with arrangements. A new series for developing jazz ensembles features some of the great jazz standards. These best-selling arrangements from Sweet Honey in the Rock founder are great addition to your choirs repertoire. Recommended. Broadway has created many timeless songs that will be performed for generations to come. Thiee are some of those songs. Many great folksongs have come from the Emerald Isle and this series gathers many of the best songs and arranges them for beginning to intermediate chorus and ensembles. From the well respected CMA (Choral Music Experience) collection, edited by Doreen Rao, is this collection of gospel songs suitable for choirs of all levels. Contemporary A Cappella Publishing is dedicated to bringing quality a cappella arrangements to the general public. Great sacred music has been with us for centuries and now there are many new sacred songs created by today's composers. This series features Christian music arranged for choirs of all abilities by some of the best arrangers of sacred music. The Daybreak series concentrates on Christian music and these are there Christmas arrangements suitable for choirs of all levels. This series is a perfect introduction to some of the great Broadway songs that have been delighting audiences for decades. You are never to young to swing to a jazz beat so get your beginning ensembles performing some of these vocal jazz standards. 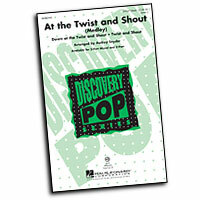 These arrangements of both classic and contemporary pop hits are suitable for both beginning and intermediate ensembles. So many great songs have come from the Disney studios with it's great collection of musicals.